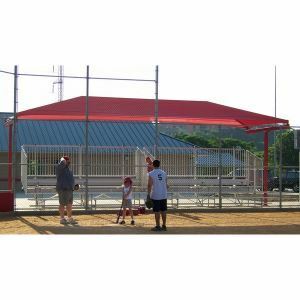 The T-Post cantilever shade structure is the perfect solution for covering smaller bleacher areas. The design allows for two posts on each end of the bleacher stand to prevent obstructing the view, while still allowing maximum shade coverage to the spectators. 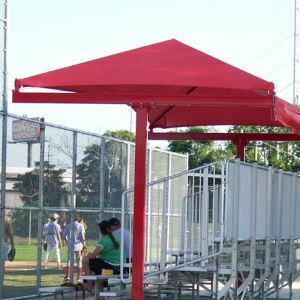 The T-Post cantilever shade structure is the perfect solution for covering smaller bleacher areas. The design allows for two posts on each end of the bleacher stand to prevent obstructing the view, while still allowing maximum shade coverage to the spectators. 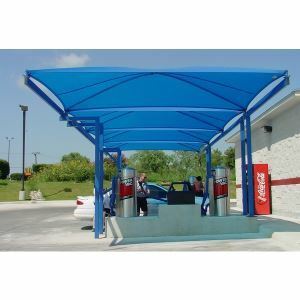 The structure has a simple hip & ridge roof style design and can be utilized in applications such as picnic areas, over swing sets, tennis courts, baseball and softball fields, as well as other sports courts. Our patented Easy Slide Tensioning device is the perfect optional feature, which allows for the easy removal and re-installation of the fabric covers.